Acrylic, measures 18″x18″. 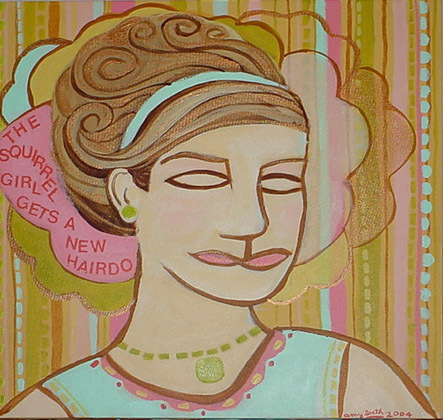 This piece is all about a new fictional hairdo. Everyone knows the feeling of trying a new “do” and wearing it out the first time. Prom maybe? Some kind of special event. The canvas is a nice square shape with all sides painted in a dark naples yellow/ yellow ochre color. She even has glittery bronze in her hair- neeto! This is a happy piece, reminiscent of Cinderella.